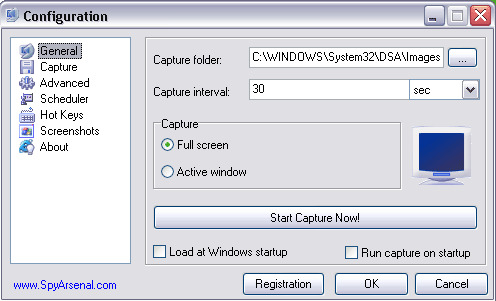 Desktop Spy Agent is an invisible and easy-to-use PC activity monitoring tool that captures screenshots of the active application window or the entire desktop at the predefined time intervals varying from 1 second to several hours and saves the recorded images to a specified directory on the hard drive. The images can later be viewed with the built-in image viewer or any external software (Desktop Spy Agent can save screenshots either as Windows bitmaps or in the industry standard JPEG format with custom compression level). This tiny and smart spy software can be used at home to control what the members of your family do on the PC when you are not watching. It is also a great employee monitoring and surveillance tool that can help you prevent the misuse of corporate resources and other, more serious, incidents. The program loads on Windows startup and quietly runs in the background completely hidden from everyone but you. It uses very little resources and does not degrade the performance of the system it is running on. The customizable hot keys enable you to start and stop monitoring, display and hide the program window, view the captured images or quit the program completely. The program can also be password-protected, so that even if someone learns the hot key, he or she will not be able to disable the snooper or modify any of its settings.